Nava’ means ‘nine’ and ‘ratri’ is made up of ‘ra’ which also means ‘night’ and ‘tri’ meaning the three aspects of our life - body, mind and soul. There are three types of botherations or problems that may affect a person - physical, mental and spiritual. That which gives you relief from all these difficulties is ‘ratri’. ‘Ratri’ or night relieves you of misery and brings comfort. The night relaxes everybody; whether happy, unhappy or miserable, everybody goes to sleep. The nine-day period of Navratri is marked by a series of Yagna and Homas. These Yagnas nullify all the misery, sorrow and pain in the world. Each day of this nine-day period has special implications and yagnas and homas are performed accordingly. In life, there are positive and negative qualities that affect us. Mathangi Homa-Get Blessed with Knowledge! If you perform this Homa, you will be blessed with Knowledge and wisdom, the two essential assets of life. All that you dream about your career and skill sets will come true with full effectiveness and involvement in them! Benefit - Gives leadership skills, Government jobs or contracts, Eye sight improvement, Vitality, doctoring, Cures - Heart disease, bone fracture, migraine, jaundice, fever, burns, cuts, wounds, gonorrhea, poisoning, skin diseases,leprosy,bilious constitution,weak eye sight, stomach, mental, derangement, headache, less of appetite, diarrhea. What is done in Mathangi Homa? Goddess Mathangi is decorated with grand attire and is offered sweets as Prasad. Sacred rhythms and vedic syllables are chanted to this Goddess to make her presence feel, on which she grants the blessings to her devotees. It is known to spiritual people that at the end of every Homa, sacrificial ghee (clarified butter), clothes and other divine things are offered to the fire-Agni Devatha. Once the fire swallows all these divine offerings, it bestows the people assembled for the gathering and the performer with all that they ask for. It is believed that Goddess Mathangi is present all over virtually and blesses and grants your wishes in person! Durga Goddess Durga is considered to be the combined force of all the Gods to destroy the evil forces. Goddess Durga in Sanskrit means a fortified or well protected place. Goddess Durga protects the mankind from the evil forces. She removes the negative thoughts such as selfishness, envy, hatred anger and ego. The shrine for Goddess Durga is near the Northern entrance of the temple. Goddess Durga, the idols of Swarnaganapthy, Shanmuga and Bhairavar were also shifted to this temple from the fort. Goddess Durga is considered to be very divine and powerful who showers Her blessings on Her devotees. Goddess Durga, the most powerful Goddess is the evil destructor! Whatever is ill in your life-health, enemies or ill luck, she can fade away all your problems at once and for all. Ask the blessings of Goddess Durga to stay away from the hassles of your life. Durga Homam People afflicted with Rahu and Kethu Doshas worship at this temple during Rahu Kalam; for, it is believed that during the Rahu Kalam, Rahu worships the Goddess everyday. Worshipping Her on Tuesdays, Fridays, Sundays, New Moon days and Full Moon days and Ashtami and Navami (8th and 9th day from the new moon or full moon day) is considered special. Worship of Goddess Durga is considered very important in Kaliyuga. The worship of Goddess Durga removes the effect of all types of black magic, unfavorable effect of negative planets, Bad luck, health problems, problems due to enemies etc. She can solve problems and is the favorite and most dependable God to the women folk. She blesses women with the power to stand against evil in their way and also blesses the childless with the gift of children. You can attain the blessings of this powerful Goddess who can bid farewell to your problems and hassles and make you live an obstacle life. Ask for anything positive against the negative and she will be with you on calling her with heart and soul. Nadi Astro Online would assist you in performing the homa (Homam) and ease to invoke these powerful radiations of Goddess Durga to rule your life without any obstacle on your way! Durga Shoolini Homam is performed to ward off powerful evil influences. All purvanga homas/poojas like Ganapathi Homa,Navagraha Homa have to be performed. Durga Sapthasathi parayanam also might need to be performed. Goddess Shoolini Durga is invoked in a Kalasha and Homam is done by chanting the Shulini Durga maha mantra. This Soolini Durga Homam helps one to get rid of mental/pshycological depression, remove fear/anxiety, cure diseases of the mind. It also protects one’s factory/industry/organization from evil influences. Lakshmi Kubera Homam is performed to invoke Goddess Lakshmi Devi and Lord Kubera, the chief deities of this endowing ritual, for accumulating wealth, eliminating debts, solving financial troubles and gaining financial stability. Who are Lakshmi Devi and Lord Kubera? Lakshmi is the divine consort of Maha Vishnu and the Goddess of wealth and prosperity. Lord Kubera is the divine treasurer of Lakshmi Devi’s wealth. It is only through Lord Kubera, Lakshmi Devi distributes Her wealth and riches to Her devotees. Shri Maha Lakshmi Homam is performed for the purpose of gaining legitimate wealth. Those who are involved in business or are facing financial problems may perform this Homam to receive the blessings and grace of Goddess Lakshmi.you must perform this homam when you are facing financial difficulties and wish to earn wealth in abundance. For improvement in Financials and also for recovery of dues, which are said to bestow different benefits to the performer of this homa. Even the mere recitation of these mantras, bestow prosperity. Ashta Lakshmi (Ashta means eight + Lakshmi means the Goddess of wealth) signifies the Eight divine aspects of Maha Lakshmi. The eight representations emphasize different forms of wealth. Wealth has many forms other than the obvious one of money. You need different types of wealth and resources to be rich in a real sense. Physical, financial, spiritual and material wealth are all needed to complete life's various needs. Adi Lakshmi Devi Homa-Get Overflowing Cashflows! If you perform this Homa, your life which seemed so struggled and tough will blossom out like a lotus flower teaching you the right way to live very peacefully! Adi" means eternal existence. Adi Lakshmi signifies the never-ending nature of the Goddess. She has no start and no end. She is continuous. Sri Adi Lakshmi Devi is the eternal support for this entire universe, the Adi Para Shakti herself. This Para Devata , this supreme Goddess, is eternally existent and is beyond creation or dissolution. When you have the grace of this Goddess, you will be blessed to experience completely auspicious happenings, and poverty will never come anywhere near you. If you do not worship Sri Lakshmi Devi on the auspicious Shravana Fridays, then you will miss a great opportunity to receive the grace of Sri Lakshmi Devi. She is known as Ramaa, means bringing happiness to the mankind. She is also known as Indira (who holds lotus or purity in the hands or heart. ) Divine Mother’s this form is normally seen serving Sri Narayana. Lord Narayana is omnipresent. Adi Lakshmi or Ramaa Lakshmi serves Sri Narayana is symbolic of her serving the whole creation. Though Sri Narayana is attended by innumerable devotees, still she personally loves to serve the Lord. Actually mother Adi Lakshmi and Narayana are not two different entities but one only. Many a place we see her form sitting in the lap of Sri Narayana. What is done in Adi Lakshmi Homa? Goddess Adi Lakshmi Devi who appears to the devotees as seated on the lotus flower, blossoms the life of others when sacred rhythms and chants are recited and dedicated to her. She is dressed in grand attire, decorated with flowers and jewels and offered Prasad. Priests chant her divine name in multiples of hundreds and make her presence feel, who thereby blossoms your life like the lotus she is seated on! It is known to spiritual people that at the end of every Homa, sacrificial ghee (clarified butter), clothes and other divine things are offered to the fire-Agni Devatha. Once the fire swallows all these divine offerings, it bestows the people assembled for the gathering and the performer with all that they ask for. It is believed that Goddess Kamala Devi is present all over virtually and blesses and grants your wishes in person! Dhanya Lakshmi Devi Homa-Get Unlimited Food Supply! Dhanya means grains. This includes all kind of purified food containing all essential vitamins, minerals, protein, calcium, carbohydrade etc. With the grace of mother Dhanya Lakshmi one gets all essential nutrients, grains, fruits, vegetables and other foods. Dhanyalakshmi is Eight-handed with green garment carries two lotuses, Mace, Abhaya mudra and Varada mudra. She is Just like Annapoorna ensuring enough food grains for everyone in the family and to the visitor of that family. In this auspicious form, she also gives the blessed, the power to be a creator of opportunity to others. She will empower her devotee to be a great giver just like Lord Narayana. Dhanya lakshmi is the goddess of the harvest and she blesses with abundance and success in harvest. She gives abundance of inner joy and ultimate happiness in life and supply infinite food supply which will not get empty. What is done in Dhanya Lakshmi Homa? Goddess Dhanya Lakshmi Devi who appears to the devotees as seated on the lotus flower, blossoms the life of others when sacred rhythms and chants are recited and dedicated to her. She is dressed in grand attire, decorated with flowers and jewels and offered Prasad. Priests chant her divine name in multiples of hundreds and make her presence feel, who thereby blossoms your life like the lotus she is seated on! It is known to spiritual people that at the end of every Homa, sacrificial ghee (clarified butter), clothes and other divine things are offered to the fire-Agni Devatha. Once the fire swallows all these divine offerings, it bestows the people assembled for the gathering and the performer with all that they ask for. It is believed that Goddess Dhanya Lakshmi Devi is present all over virtually and blesses and grants your wishes in person! Veera Lakshmi Devi Homa-Get Overflowing Cashflows! Dhairya Lakshmi is the powerful form of mother Lakshmi who grants the boon of infinite courage and strength. For those who worship mother Dhairya Lakshmi will live and lead a life with tremendous patience and inner stability. Dhairya Lakshmi is Eight-armed with red garments. She carries Chakra, Shankh, Bow, Arrow, Trishul, Gold bar or book, Abhaya mudra and Varada Mudra. Dhairya Lakshmi gives the courage to face any circumstances and adversities in life. She will also grant us success in any and all undertakings in life. If any enemies are causing you unbearable agony, the worship of Sri Vira Lakshmi Devi will weaken them and make them unsuccessful. Sri Vira Lakshmi Devi is none other than Vaishno Devi, the presiding deity in the Vaishno Devi Temple in Jammu, a beautiful city in the northernmost part of India. The worship of this form of Mother Lakshmi will grant you immense physical strength and mental courage. What is done in Veera Lakshmi Homa? Goddess Veera Lakshmi Devi who appears to the devotees as seated on the lotus flower, blossoms the life of others when sacred rhythms and chants are recited and dedicated to her. She is dressed in grand attire, decorated with flowers and jewels and offered Prasad. Priests chant her divine name in multiples of hundreds and make her presence feel, who thereby blossoms your life like the lotus she is seated on! It is known to spiritual people that at the end of every Homa, sacrificial ghee (clarified butter), clothes and other divine things are offered to the fire-Agni Devatha. Once the fire swallows all these divine offerings, it bestows the people assembled for the gathering and the performer with all that they ask for. It is believed that Goddess Veera Lakshmi Devi is present all over virtually and blesses and grants your wishes in person! Gaja Lakshmi Devi Homa-Get Prosperity, Good luck and Abundance ! She is four-armed in red garments In each of her upper pair of arms, she carries a lotus, and the lower hands are generally shown in abhaya and varada mudra. Gajalakshami will bestow you prosperity and fame. The elephants flanking her are shown as pouring water from their trunk over the goddess. Elephants signify splendor and royalty. In this aspect, the goddess is depicted seated on a lotus, flanked on both side by Elephants (gaja). Gajalakshmi is shown as seated in Padmasana yogic posture, and has four arms. Maha Lakshmi came out of the ocean during the churning of the ocean (Samudra Manthan). So she is known as a daughter of the ocean. She came out of the ocean sitting on a full-bloomed lotus and also having lotus flowers in both hands with two elephants by her sides, holding a beautiful vessel filled with milk and pouring it over Sri Lakshmi. Many a time we see Sri Lakshmi standing in the lotus and elephants are pouring nectar over her. Gajalakshmi like most other aspects of Lakshmi is representative of prosperity, good luck, and abundance. What is done in Gaja Lakshmi Homa? Goddess Gaja Lakshmi Devi who appears to the devotees as seated on the lotus flower, blossoms the life of others when sacred rhythms and chants are recited and dedicated to her. She is dressed in grand attire, decorated with flowers and jewels and offered Prasad. Priests chant her divine name in multiples of hundreds and make her presence feel, who thereby blossoms your life like the lotus she is seated on! It is known to spiritual people that at the end of every Homa, sacrificial ghee (clarified butter), clothes and other divine things are offered to the fire-Agni Devatha. Once the fire swallows all these divine offerings, it bestows the people assembled for the gathering and the performer with all that they ask for. It is believed that Goddess Gaja Lakshmi Devi is present all over virtually and blesses and grants your wishes in person! Santhana Lakshmi Devi Homa-Get a greatest gift of your life now! Santhana Lakshmi is Six-armed with two Kalashas (with mango leaves and Coconut on it ), Sword, Shield, a child on her lap, Abhaya mudra and other hand holding the child. The child is seen holding the lotus flower in his hand. ‘Santhana’ means children. With Mahalakshmi’s blessings, you will be blessed with children who bring joy in your life and make you proud of them. With Santhana Lakshmi’s blessings you will get desirable children who will bring you wealth, fame and peace in the life. In the family life, the children are the greatest treasure source of happiness, joy and your hope. Child is greatest gift given by god to mankind. Lakshmi is goddess of Progeny and Child birth. Marriage life without children is like a garden without flowers. People try different methods to get child and because of it they go through a lot of sufffering and mental pains. With the grace of Mother Santhana Lakshmi one may blessed with children. Santhana Lakshmi is ruler of children. If your child became sick, ill or misbehaving on his manners or if they doesn't obey you then Santhana Lakshami homam may be helpful. Santhana Lakshami homam to get child or for the well being of their children. What is done in Santhana Lakshmi Homa? Goddess Santhana Lakshmi Devi who appears to the devotees as seated on the lotus flower, blossoms the life of others when sacred rhythms and chants are recited and dedicated to her. She is dressed in grand attire, decorated with flowers and jewels and offered Prasad. Priests chant her divine name in multiples of hundreds and make her presence feel, who thereby blossoms your life like the lotus she is seated on! Vijaya Lakshmi Devi Homa-Get Victory in all your endeavours ! Vijaya Lakshmi is Eight - Armed dressed in red garments with Chakra, Shankh, Sword, Shield, lotus, paash, other two hands depicting abhaya mudra and varada mudra. Vijaya Lakshmi will grant you success in all your undertakings and all different facets of life.Some are strong physically but weak mentally while others are economically rich but poor in their attitude and cannot exert any influence. Vijay is to have all encompassing victory. Vijay is to rejoice glory of our real nature - Vijay is to conquer the lower nature.Vijay is the victory in external and internal wars and of course eternal wars! Hence those, with grace of mother Vijay Lakshmi, have victory everywhere, at all time, in all conditions. What is done in Vijaya Lakshmi Homa? Goddess Vijaya Lakshmi Devi who appears to the devotees as seated on the lotus flower, blossoms the life of others when sacred rhythms and chants are recited and dedicated to her. She is dressed in grand attire, decorated with flowers and jewels and offered Prasad. Priests chant her divine name in multiples of hundreds and make her presence feel, who thereby blossoms your life like the lotus she is seated on! Vidhya Lakshmi Devi Homa-Get the greatest wisdom and knowledge in your life ! Vidhya Lakshmi is four-armed, dressed in white garments. She carries two lotuses each in her two hands, abhaya mudra and Varada mudra in other two hands. Vidhya Lakshmi will give you all the 18 qualities for immortality such as Serenity, Regularity, Absence of Vanity, Sincerity, Simplicity, Veracity, Equanimity, Fixity, Non-irritability, Adaptability, Humility, Tenacity, Integrity, Nobility, Magnanimity, Charity, Generosity and purity. Wisdom means understanding cosmic secrets, opening of seven Chakras of our body, nirvana etc. Goddess Vidhaya Lakshmi rules also those elements. In exams besides study luck is also major fact to gain good marks. By doing Vidhaya Lakshmi homam it may be easy for you in exam. If your child doesn't study and obey you then Vidhaya Lakshmi homam may be helpful. Vidhaya Lakshmi homam is helpful to students, researchers, writers etc. It is also helpful to people who practicing the Seven Chakras awaking Sadhana. Vidhya is education. Education is not mere studies to receive the degrees and diplomas certificates from the educational institutes or universities but it is to make you more human. Education, which cannot give peace to the soul or cannot give the knowledge of the Self and the inner satisfaction, is not education.Education, which cannot wipe the tears of others, known or unknown, is not education. Education is the understanding the situation and silence or art of living and leading the life that can make the life, the Life Divine, where the ultimate Goal of the life is the God-Realisation. Such Education can come only through discrimination and dispassion. One can have abundant amount of money, but if he does not know how to make good use of it, it will work to his disadvantage. If an alcoholic or a drug addict gets a big sum of money, it will only hasten his downward journey to destruction. Vidhya Lakshmi is the understanding and the knowledge to mold the ordinary life into the Divine Life. A life of Service, a life of feeling for a fellow being, a life of charity and generosity, a life of purity, a life for seeking a soul within the soul and a life with an ultimate aim of the realization is the only real education, which can come only with the grace of Vidhya Lakshmi. What is done in Vidhya Lakshmi Homa? Goddess Vidhya Lakshmi Devi who appears to the devotees as seated on the lotus flower, blossoms the life of others when sacred rhythms and chants are recited and dedicated to her. She is dressed in grand attire, decorated with flowers and jewels and offered Prasad. Priests chant her divine name in multiples of hundreds and make her presence feel, who thereby blossoms your life like the lotus she is seated on! It is known to spiritual people that at the end of every Homa, sacrificial ghee (clarified butter), clothes and other divine things are offered to the fire-Agni Devatha. Once the fire swallows all these divine offerings, it bestows the people assembled for the gathering and the performer with all that they ask for. It is believed that Goddess Vidhya Lakshmi Devi is present all over virtually and blesses and grants your wishes in person! Dhana Lakshmi Devi Homa-Become a Billionaire now! Dhana Lakshmi is six-armed dressed in red garments. She carries chakra, shankha, kalasa or amrita kumbha ( A pitcher containing amrita/ elixir of life ), bow-arrow, a lotus and one hand depicting abhaya mudra with gold coins falling from it. Dhana means wealth. Not only wealth in coins and currencies but also in many forms like Love, Nature, Peace, Health, Prosperity, luck, virtues, family, food, land, water, will power, intellect, character etc. Dhana Lakshmi or Dhanalakshmi is form of wealth giving goddess Lakshami. If you are wishing for money, expansion on business, planning to buy property or opening new shop or factory etc then Dhana Lakshami homam may be most helpful. What is done in Dhana Lakshmi Homa? Goddess Dhana Lakshmi Devi who appears to the devotees as seated on the lotus flower, blossoms the life of others when sacred rhythms and chants are recited and dedicated to her. She is dressed in grand attire, decorated with flowers and jewels and offered Prasad. Priests chant her divine name in multiples of hundreds and make her presence feel, who thereby blossoms your life like the lotus she is seated on! It is known to spiritual people that at the end of every Homa, sacrificial ghee (clarified butter), clothes and other divine things are offered to the fire-Agni Devatha. Once the fire swallows all these divine offerings, it bestows the people assembled for the gathering and the performer with all that they ask for. It is believed that Goddess Dhana Lakshmi Devi is present all over virtually and blesses and grants your wishes in person! Mangala Gowri Homa-Invite Auspiciousness to Erase Negativity! What is done in Mangala Gowri Homa? Mangala Gowri, the auspicious and celebrated Goddess is worshipped in a very divine and orthodox way. She is dressed up very well and decorated with flowers and offered sweets as Prasad. Sacred priests very religiously chant her mantras and slokas in order to make her presence feel, on which she blesses her devotees with their wishes. It is known to spiritual people that at the end of every Homa, sacrificial ghee (clarified butter), clothes and other divine things are offered to the fire-Agni Devatha. Once the fire swallows all these divine offerings, it bestows the people assembled for the gathering and the performer with all that they ask for. It is believed that Goddess Mangala Gowri is present all over virtually and blesses and grants your wishes in person! Karba Rakshambigai Karbarakshambigai is a divine manifestation of Parvathi Devi, the consort of Lord Shiva, and the embodiment of motherhood. Parvathi Devi incarnated as Karbarakshambigai to protect a child in the womb of Her devotee who was cursed by a sage. Since then, Karbarakshambigai has been protecting expectant mothers and blessing couples with healthy children. 'Karba' means pregnancy, 'Raksha' means protection, and 'Ambigai' is one of the names of Goddess Parvati. Worshipping Goddess Karbarakshambiga, bestows an expecting mother with the blessing to undergo safe delivery of her baby. The divine energy of the extremely effective Karbarakshambiga pooja heals many complications and issues related to fertilities and pregnancies. The impediments in the process of getting pregnant are smoothened with the beam of positive energy which rejuvenates the couple, and thereby paves the way for a healthy offspring. Homam Karbarakshambigai Homam is considered to be the powerful way to seek the blessings and grace of the Devi. For centuries, Karbarakshambigai has been known for bestowing couples with children and ensuring safe delivery. Karbarakshambigai slokas and mantras chanted during the Homam evoke the maternal love of Parvathi Devi so that She takes utmost care of Her devotees-right from protecting the child in their womb to ensuring safe delivery. The benefits of performing this homam are removal of santana dosham, birth of gifted children, protection of the womb during pregnancy (garbha raksha), protection for new born children etc. Goddess Karbarakshambigai is for avoiding miscarriages during pregnancy, ensuring safe delivery and bestowing children. Karbarakshambigai Homam also bestows you with a good life partner and a happy married life. Karbarakshambigai Homam is a priceless boon to couples who long for an offspring. None but only a mother could understand the joy, the blessings and the complications of being a mother. That is why Karbarakshambigai is the most sought after Goddess for progeny. And Karbarakshambigai Homam is second to none to fulfill your motherly desires. She has special power to ensure good health and well being of the expectant mothers. Well, if you are at an early stage of life and searching for a life partner, Karbarakshambigai Homam can help you find your soulmate. Performing this Homam on Panchami Thithi is considered to be highly beneficial. We Nadi Astro online would help you perform Karbarakshambigai Homam and win the love and affection of Karbarakshambigai for fulfilling your longing to parent a child and lead a happy married life. Saraswathi Homam - Education, research, music, singing, dancing, acting, painting, sculpture. Saraswathi Saraswathi Devi is the consort of Lord Brahma, the creator of Universe, and is the embodiment of knowledge and arts. It is only with the help of Saraswathi Devi's knowledge, Lord Brahma created the universe and its beings. Among her other renowned names, Saraswathi Devi is also known as Kalaivani, bestower of arts, and Vagdevi, Godess of speech and sound. In India, the name Saraswathi is synonymous with education and knowledge. Children are initiated to read and write alphabets only on Vijayadasmi as the blessings of Saraswathi Devi are abundant on this auspicious day. Moreover, whatever deeds one undertakes on this day turns out to be victorious. To please such popular and great Saraswathi Devi and win Her love, affection and blessings, Saraswathi Homam is a simple but very potent way. Homam If you think Saraswathi Homam is only for students, think again! Saraswathi Homam has the power to bestow the inclination and ability to learn arts like music, dance and so on. Also, Saraswathi Homam enhances the proficiency and creativity of artists(like dancers, singers, musicians, painters, etc.,). And even those artists who lack inspiration and are suffering from creative blocks can benefit from Saraswathi Homam as it removes the blocks that hinder the flow of creative energy in them. Saraswathi Homam comes as a great boon for students as Saraswathi Devi has the power to sharpen your intellect, discerning sense and memory. Therefore, the student's ability to grasp and understand things are enhanced. Also, Saraswathi Homam has the potential to calm your mind, heighten your awareness and awaken your spiritual energies. This naturally improves the concentration of a student without him/her making any efforts. To realise the power of knowledge, speech, creativity and other boons of Saraswathi Devi, performing Saraswathi Homam on Thursdays, Fridays and on Panchami Thithis and Guru Horas are best recommended. 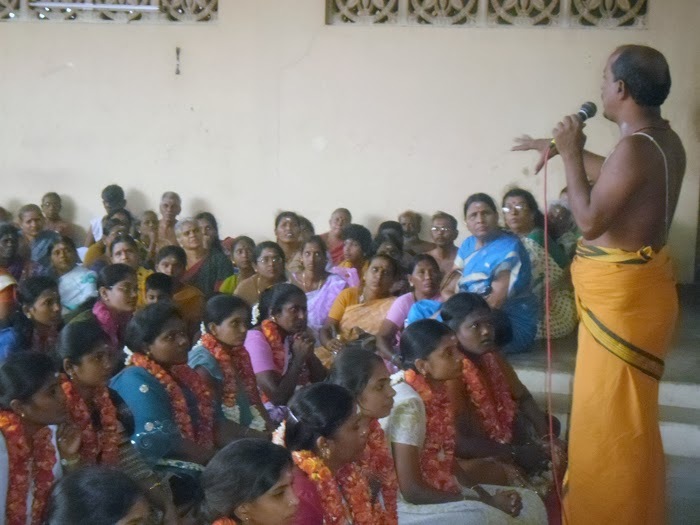 Whether you seek to overcome speech impediments or wish to still a massive crowd with your influential speech, Saraswathi Homam can fulfill your desires. Since Saraswathi Devi, as the goddess of speech and sound, resides on the tip of your tongue, She has this special grant to effectively enhance your communication skills. Therefore, Saraswathi Homam is a highly beneficial tool for politicians, orators, businessmen, celebrities and all those who want to touch the peak of their career/professional life. We Nadi Astro online would help you in performing Saraswathi Homam and ensures that all your desired goals and needs are fulfilled. Pratyangira Devi Devi Pratyangira is the Goddess associated with eternal energy. She is manifest with a lion's face and a human body.She is said to be a very protective goddess who protects her devotees like a Mother. This combination of lion and human forms is said to represent the balance of good and evil. The Devi is seated on a chariot, pulled by four Lions, Devi Lakshmi and Devi Saraswathi are also present on either side.The Maha Pratyangira Homam is a powerful remedy for all problems at the workplace in particular. If you are suffering from obstacles, jealousies and an unfavourable environment at the workplace, perform this homam to invoke the protection and blessings of Maha Pratyangira Devi. Goddess Prathyangara Devi is worshipped for curing all illness and to prevent major accidents and any health issues caused due to poisoning. It is also believed worshipping this Goddess helps in the removal of all mental blocks. This homam will be performed on New Moon Day and Ashtami day for getting powerful energy. Mahapratyangira Homam Pratyangira Devi, prime among the Parivaramoorthies (accompanying goddesses) of Raja Rajeswari, identified as Parasakthi and dweller in Sri Chakra, emanated from the Third Holy eye of Mahadeva, possessing the most beautiful feminine body but with the face of lioness. Pratyangira surpasses Bhadrakali Devi in fury; but for those who approach Her for protection, She is a veritable mother. Pratyangira who devours demons, ghosts and all evil spirits will root out the pernicious effects of all evil deeds - deliberate or otherwise - perpetrated by one's enemies thereby ensuring protection and fearless existence. Mahapratyangira Homam will ensure lifelong protection from the influence of evil spirits. The devotees are advised to participate in Mahapratyangira Homam in order to get rid of the dangers caused by enemy action and to gain success in all their ventures. ஹதராபாத் முன்னாள் நாடாளுமன்ற உறுப்பினர் உயர்திரு.N.ஹரிகிருஷ்ணா அவர்கள் ஸ்ரீ தன்வந்திரி ஆரோக்ய பீடத்திற்கு வருகை தந்து ஸ்ரீ தன்வந்திரி பகவானையும், இதர 65 பரிவார தெய்வங்கள் மற்றும் லிங்க வடிவில் அமைந்திருக்கும் 468 சித்தர்களையும் தரிசித்தார். பின்னர் பீடத்தில் நடைபெற்ற தன்வந்திரி ஹோமத்திலும் கலந்து கொண்டு, கயிலை ஞானகுரு டாக்டர் ஸ்ரீ முரளிதர ஸ்வாமிகளின் ஆசிகளை பெற்று பின்னர் பீடத்தில் வைக்கப்பட்டிருக்கும் பார்வையாளர்கள் பதிவேட்டில் பீடத்தை பற்றிய தனது அனுபவங்களை எழுதி சென்றார். ஸ்ரீ தன்வந்திரி ஆரோக்ய பீடத்திற்கு போத்தீஸ் நிறுவனத்தினர் தங்கள் குடும்பத்தினருடன் வருகை தந்து ஸ்ரீ தன்வந்திரி பகவானையும், பரிவார தெய்வங்களையும், லிங்க வடிவில் அமைந்திருக்கும் 468 சித்தர்களையும் தரிசித்து கயிலை ஞானகுரு டாக்டர் ஸ்ரீ முரளிதர ஸ்வாமிகளின் ஆசியை பெற்று சென்றனர். ஸ்ரீ தன்வந்திரி ஆரோக்ய பீடத்திற்கு பள்ளி மாணவ, மாணவியர்கள் மற்றும் ஆசிரியைகள் வருகை தந்து ஸ்ரீ தன்வந்திரி பகவானையும், இதர 65 பரிவார தெய்வங்களையும், 468 சித்தர்களையும் தரிசித்து தன்வந்திரி பகவானின் அருளையும், கயிலை ஞானகுரு டாக்டர் ஸ்ரீ முரளிதர ஸ்வாமிகளின் ஆசியையும் பெற்று மகிழ்ந்தனர். பள்ளி மாணவ, மாணவியர்கள் கூட்டு பிரார்த்தனை செய்த காட்சி. ஒவ்வொருவருக்கும் வாழ்வில் மிக முக்கியமான ஒன்றாக கருதப்படுவது திருமணம் ஆகும். அந்த திருமண நிகழ்வு பல தோஷங்களால் தடைபட்டு திருமணம் நடப்பதில் கால தாமதம் ஏற்படுகிறது. இந்த திருமணத் தடைகளை நீக்கி உடனே திருமணம் ஆவதற்கு வழிவகை செய்யும் எங்களது சுயம்வரகலா பார்வதி ஹோமம். எனவே திருமணங்கள் ஆகாதவர்கள் அவர்களது திருமணத் தடங்கல்களை முழுமையாக நீக்கி அவர்களுக்கு நல்ல முறையில் உடனே திருமணம் நடப்பதற்காக இந்த ஹோமம் செய்யப்படுகிறது. இந்த ஹோமத்தில் முதலில் கணபதி பூஜை, கிரக தோஷங்கள் நீங்குவதற்காக நவகிரக ஹோமம் நடத்தப்படுகிறது. பின்னர் திருமணம் உடனே நடக்க வேண்டி சங்கல்பம் செய்து இறுதியாக சுயம்வரகலா பார்வதி ஹோமம் சிறப்பாக நடத்தப்பட்டு வருகிறது. இந்த சுயம்வரகலா பார்வதி ஹோமம் செய்வதின் மூலம் அடையும் பலன்கள் ஏராளம். எல்லாவிதமான திருமணத் தடைகளும் நீங்கி உடனே திருமணம் செய்து மகிழ்ச்சியாக வாழலாம், கணவனுக்கு ஏற்ற மனைவியும், மனைவிக்கு ஏற்ற கணவகும் அமைவார்கள். 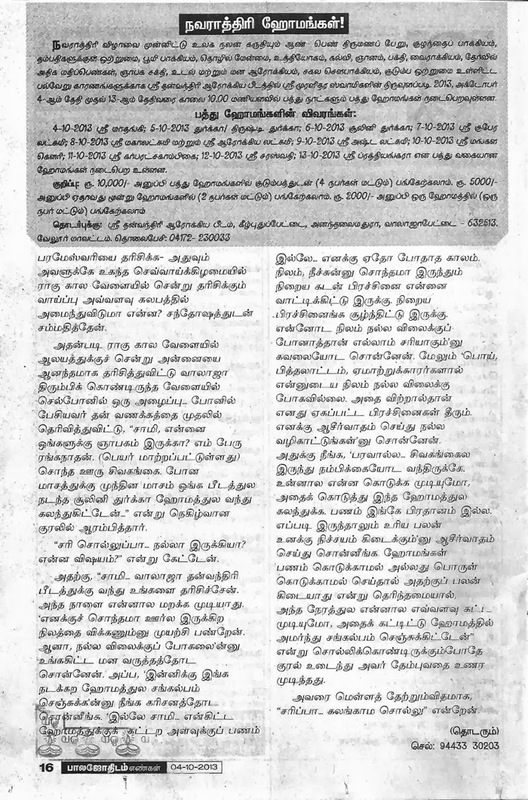 மேலும் அவர்களுக்கு இடையேயான இல்லற வாழ்வு மிகவும் அன்பாகவும், மகிழ்ச்சியாகவும், ஒற்றுமையாகவும் இருக்கும். மேலும் ஸ்ரீ தன்வந்திரி ஆரோக்ய பீடத்தில் 8 ஆண்டு காலமாக பலவிதமான சிறப்பு ஹோமங்கள் நடைபெற்று வருகின்றது. 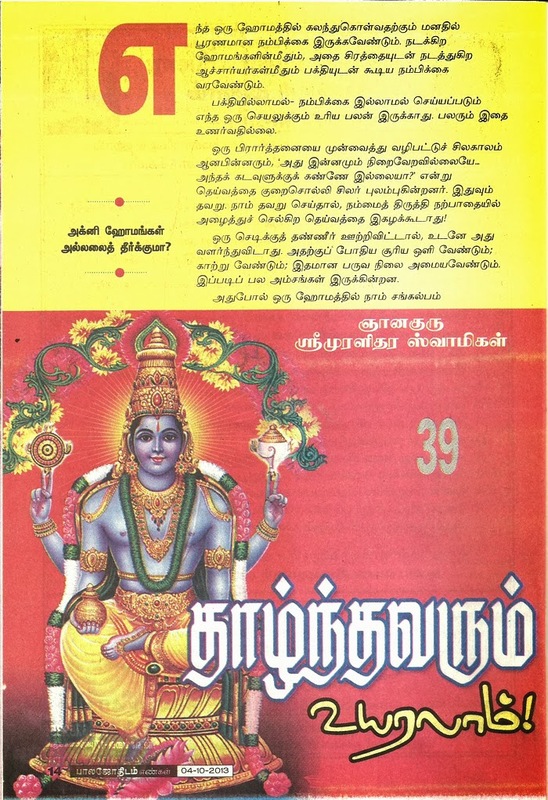 இதில் பிரதி மாதம் 3வது ஞாயிற்றுக்கிழமையில் திருமணமாகாத ஆண்களுக்கான கந்தர்வராஜ ஹோமமும், பிரதி மாதம் கடைசி ஞாயிற்றுக்கிழமையில் பெண்களுக்கான சுயம்வரகலாபார்வதி ஹோமமும் நடைபெற்று வருகிறது. ஸ்ரீ தன்வந்திரி ஆரோக்ய பீடத்தில் ஸ்ரீ தன்வந்திரி பகவானின் அருளாலும், கயிலை ஞானகுரு டாக்டர் ஸ்ரீ முரளிதர ஸ்வாமிகளின் ஆசியுடனும் நடைபெற்று வருகின்ற இந்த ஹோமங்களில் கலந்து கொள்ள விரும்பும் ஆண்கள் மற்றும் பெண்கள் கீழ்கண்ட முகவரியினை தொடர்பு கொள்ளவும். ஸ்ரீ தன்வந்திரி ஆரோக்ய பீடத்தில் தேய்பிறை அஷ்டமியை முன்னிட்டு 27.9.2013 வெள்ளிக்கிழமை காலை 10.00 மணி முதல் 1.00 மணி வரை கால பைரவர், சொர்ணாகர்ஷண பைரவர் ஹோமம் நடைபெற்றது. இதில் பக்தர்கள் கலந்து கொண்டு ஸ்ரீ தன்வந்திரி பகவானின் அருளையும், கயிலை ஞானகுரு டாக்டர் ஸ்ரீ முரளிதர ஸ்வாமிகளின் ஆசியையும் பெற்று, பின்னர் நடைபெற்ற அன்னதானத்திலும் கலந்து கொண்டனர். Ten homams will be performed over ten days during the Navarathri festival at Sri Danvantri Arogya peedam, Walajapet, from October 4 to 13, 2013, Peedam founder Kayilai Gnanaguru Dr Sri Muralidhara Swamigal has announced. Four persons from a family can participate in all the ten homams on payment of Rs 20,000. Two persons from a family can take part in three homams on payment of Rs 5,000. One person can participate in one homam on payment of Rs 3,000. These concessions will be on offer to Navarathri Festivel Days. Ambigai appears in three forms – Durga, Lakshmi and Saraswathi for the benefit of mankind. On the first three days of the Navarathri festival, Ambal mis worshipped as Durga Shakthi; on the next three days as Lakshmi and the last three days as Saraswathi. Durga banishes misery and sorrow. Lakshmi bestows wealth and prosperity, ending financial stress. Knowledge is essential and that is why Saraswathi is worshipped on the last three day. On the tenth day, on Vijayadasami day, Ambigai fights and destroys evil and establishes the rule of dharma. The ten homams at the Peedam during Navarathri period will help eliminate evil effects of doshams and dhristis, help people get married and have progeny, improve business and memory power, and promote family unity, among others. Sri Muralidhara Swamigal has appealed to the people to participate in the homams and derive the benefits. Phones: 91-4172-230033 / 0-94433 30203. Timings and days of the poojas are subject to change. Those making the above payment should write to the Peedam giving all details of homam, date, names, address, contact details, etc., or mail all the details to the ID given below.